Heat oven to 400°F. In 2-quart saucepan, melt butter over medium heat. Cook onion in butter 3 minutes, stirring occasionally, until tender. Add flour; cook 1 minute, stirring constantly. Stir in whipping cream, salt and pepper. Cook 30 seconds or until thickened. Remove from heat; stir in spinach, 1/2 cup of the Parmesan cheese and the Monterey Jack cheese until blended. Remove pie crusts from pouches; unroll on work surface. With 2 1/2-inch round cookie cutter, cut 12 rounds from each crust; discard scraps. Fit rounds into 24 ungreased miniature muffin cups, pressing in gently. 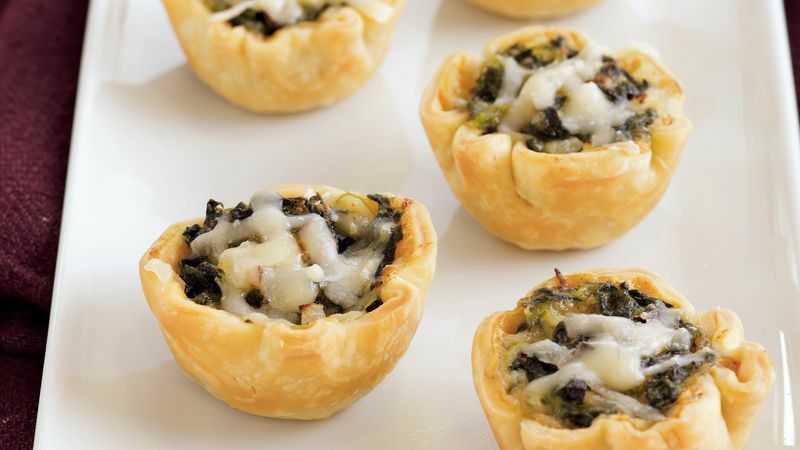 Divide spinach mixture evenly among muffin cups. Bake 18 to 20 minutes or until edges are light golden brown. Sprinkle evenly with remaining 1/2 cup Parmesan cheese. Cool 5 minutes; remove from pans. Serve warm. To quickly thaw spinach, cut small slit in center of pouch; microwave on High 2 to 3 minutes or until thawed. Remove spinach from pouch; squeeze dry with paper towels.